These top shelf pen and pencil kits are plated with rhodium, an exquisite and valuable precious metal from the platinum chemical group. Rhodium is extremely durable. 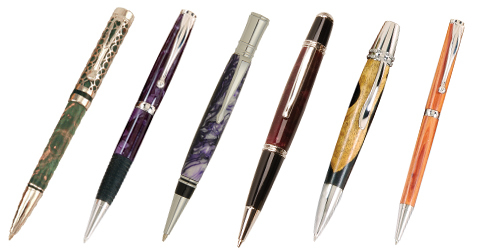 Pens produced with rhodium plating will not tarnish and are very resistant to scratching and acids. These mechanisms will be the favorite of pen turners and collectors alike. Each Platinum Group Kit includes an attractive Identification Card that explains the rhodium plating. Also included is a place for you to sign the card and give information about the wood or other material used in the pen.